While we’re on the topic of great Boone county artistes, I thought I might share my Hasil Adkins story, tiny though it may be. Back in 1989, when I was just starting Radio Free Charleston, one of the hooks that used to get my boss to let me do the show was that I would play local music. However, at that time, I hadn’t hooked up with any local musicians (that would change later). So to find some local music, I headed down to Elkins Record Shop on Central Avenue (you could actually go to Central Avenue without a bullet-proof vest in those days) and asked if they had any singles by local artists. Yes, these were still back in the days of vinyl, and Elkins was responsible for stocking most of the local Jukeboxes. The only thing they had that wasn’t off-tune gospel music was a 7″ single by Hasil Adkins called “Big Red Satellite”. I was stunned by the raw quality of the music, and Hasil was the very first local artist that I played on Radio Free Charleston. Later on, George Rollins hooked me up with more Hasil music to play on the show, but it wasn’t until after Radio Free Charleston ended that I actually got to meet Hasil and see him perform at the Empty Glass. It was a singular experience. There are a couple of DVDs floating around that try to show Hasil in action, but nothing could possibly capture the energy and pure psycho mojo that poured out of this man. He sat alone behind the drum kit with a guitar, harmonica, and God knows what else, and he made the most astounding noise I’ve ever heard. It was like being in a holy-roller church, a livestock auction, a crackhouse, and a cell with Charlie Manson, all at the same time. I don’t think I’ve ever been closer to real, pure rock n’ roll than I was that night. 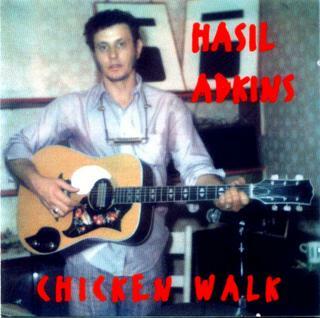 “One-man band” does not do justice to Hasil Adkins. He was a one-man force of nature. I got to meet Hasil and hang out with him briefly. I was later told that I was the only radio person he met that he didn’t take an instant dislike to. So I don’t have any stories about death threats or the brandishing of weapons. I just knew Hasil as a quiet, humble guy who made amazing music. Hasil is gone now. He passed away in April. You can visit his official site http://www.hasiladkins.com and leave your condolences. Whether you have a tear in your eye, or breath a sigh of relief, you have to agree that the likes of Hasil Adkins will not walk this Earth again.